The DataCal Albanian language keyboard labels are a high-quality, durable and economical solution for creating a Albanian bilingual keyboard. The Albanian keyboard layout uses a system of deadkeys (highlighted in yellow below) to type certain accented characters.To use the deadkey system, first type the deadkey; nothing will appear on the screen. Next, type the key (generally a vowel) that you wish to combine with the deadkey. You should then see the accented character that you want on the screen.If you press a deadkey and then a press a key that does not go with that accent(such as pressing an accent and the number "2"), nothing happens; the accent deadkey must be correct to work. Depending upon the language, deadkeys work with both unshifted and shifted keys. Many languages include more characters than canbe typed on a standard computer keyboard. To solve this problem, additional characters may be assigned to the right AltGr key (the right Alt key) and/or the Shifted AltGr key. In Europe, the right Alt key is referred to as the AltGr key.In the United States, it is merely the right Alt key. It is important to note that the left Alt key cannot be used as the AltGr key. This language uses the European style 102 keyboard layout. 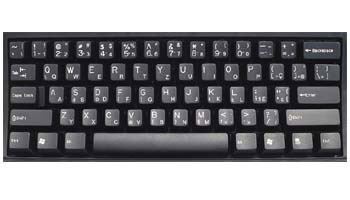 This keyboard layout features a key in the lower left corner of the keyboard (next to the US English "Z" key) that is not found on standard US 101 keyboards. If you are using a standard US 101 keyboard, you will not be able to use this label. If you are using the US 101 style keyboard and wish to type the characters on the 102 key, you will have to switch back toEnglish to be able to type these characters or use the Alt key input method.